John Doyle, Senior Director of Product Marketing on the Cloud & Enterprise team at Microsoft, will host the keynote at the inaugural Data & BI Summit. His team’s responsibilities include product marketing, messaging, positioning, licensing, pricing, channel training, interfacing with the development team, sales and account support engagements, and branding efforts. Before joining Microsoft, Doyle held product management, marketing, business development and engineering roles at start up and multinational companies including Philips. 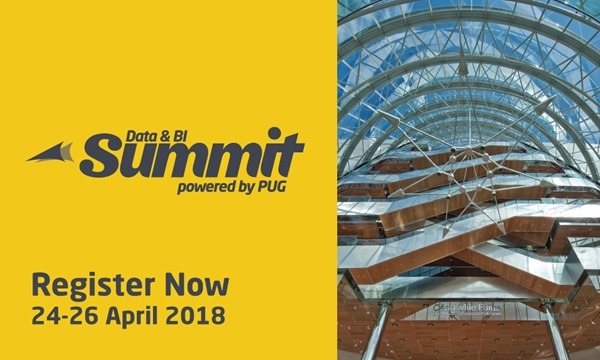 Join Business Analysts, Data Professionals & Power BI Users at the inaugural Data & BI Summit, located in Dublin, Ireland 24-26 April 2018 at the Convention Centre Dublin. Take advantage of Advanced Pricing and save up to €200 before 15 March. After this date, tickets will be sold at full price. · Introduction to M Programming – Join Microsoft MVP, author and conference favorite Chris Webb as he shows several practical examples of how to use M.
· Advanced Power BI Embedded Development Topics – Presented as part of the Microsoft Power Series you won’t want to miss this hands-on deep dive into Power BI Embedded by Nimrod Shalit, Microsoft Program Manager and data enthusiast.